Have you heard about those OPEC meetings where leaders from oil-producing nations agree to production rates to control the price of oil around the world? Have you ever wondered what those meetings are like? Is everyone at these OPEC meetings sitting on chairs made of solid gold, speaking while a team of servants fans them and feeds them grapes? Or are these meetings remarkable because they are as normal as a school board meeting in Lincoln, Nebraska? Dr. Kent Moors, an investing guru for the Agora affiliate Money Map Press, attends those OPEC meetings. 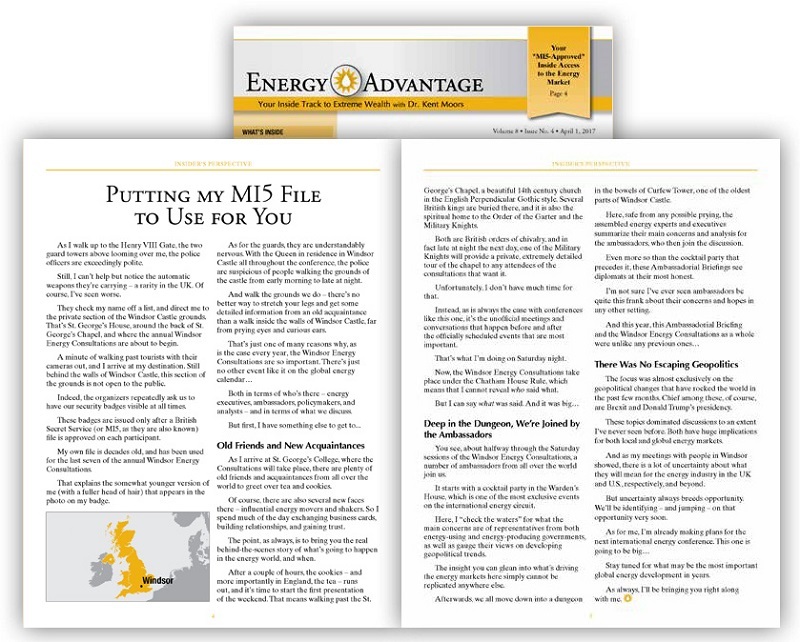 Each month in his publication Energy Advantage, Dr. Moors provides insights on which companies consumer investors should buy based on his insider knowledge. I had the opportunity to work with the cracker-jack editorial team at Money Map Press this spring. Dr. Moors has always been a great storyteller. He provides in-depth analysis into the companies he recommends to investors and gives you a clear mental picture as to why he believes its stock is a great investment. I began to ask about Dr. Moors himself. He’s an advisor to foreign governments, U.S. states, and some of the largest energy companies in the world. He attends the OPEC meetings to consult with his clients, and has attended the last seven annual Windsor Energy Consultations held at Windsor Castle —the same Windsor Castle where the Queen of England lives. While subscribers appreciate insider stock picks, investors who follow the energy sector would love to learn more about an insider event and the facility that hosts it. The result is an excellent story in a recent issue detailing Dr. Moors’ experience at Windsor Castle. While customers subscribe for logical reasons, they retain their subscription because of emotional connections. If you surprise, delight, and entertain your readers with unique stories, you’ll keep them. Perhaps your subscribers wouldn’t care about a meeting of the world’s energy producers in the English countryside. But what do they want to know more about? Your subscribers join because of logical benefits they want to access, and you stop them from quitting by fostering an emotional connection through a unique personality.